The name comes from the Serbian word “klisura” and means the Danube Gorge or Gate. The place also known as Defileul Dunării is actually the area where the Danube enters Romania. Located in southern Romanian Banat, at the border with Serbia this place includes tourist attractions like the Baziaş Gulf, the Dead Nera (Nera Moartă in Romanian; Nera is a river crossing Banat region and entering Danube in Clisura) natural reservation, the Dacian fortress or the castrum (Roman camp) in Divici or the Martins’ Lavin (Râpa cu lăstuni in Romanian) natural reservation in Divici. A lacustrine village opened with European funds in gulf Berzasca in Clisura should make 30 bungalows available to tourists starting this spring. By car, Clisura Dunării can be reached from Timişoara on road DN 57 up to Oraviţa, then Moldova Nouă. In Naidăş locality take the road to Zlatiţa, Socol and Baziaş, all three of them localities in Clisura Dunării. The wilderness in Cheile Nerei is still untouched thanks to the difficult access in the area. Spreading on almost 37000 hectares around the middle course of the Nera River, this karst area hides an amazing floral richness, very diverse and unique landscapes. 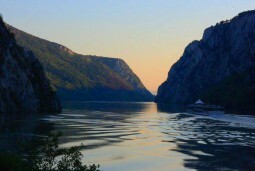 The main attractions here are the gorge dug by Nera River and its tributaries, the karst lakes Eye of the Bey (Ochiul Beiului in Romanian) and Devil’s Lake (Lacul Dracului in Romanian), the waterfalls Beuşniţa, Bigăr and Şuşara, the caves and abysses Plopa, Ponor, Dubova and Ox’s Cave (Peştera Boilor). Cheile Nerei- Beuşniţa national park is located in the south region of Aninei Mountains in Caraş-Severin County. The park can be reached on roads: Resita – Oravita – Sasca Montană, Reşiţa – Oraviţa – Anina – Bozovici, Reşiţa – Anina – Bozovici, Bozovici – Şopotu Nou – Cărbunari. With a difference of level of -236 meters and a length of 1029 meters, this is the deepest abyss (very deep chasm) in Banat. It is actually a chain of steep wells and galleries with a creek at the end of it, the trail of which gets lost in a deep gallery. Unfortunately, the abyss can be visited by experienced speleologists only, but a visit to its impressive entrance can be very interesting. The abyss is located at about 6 kilometers from Cuptoare locality in Caraş-Severin County, close to the mountain trail marked by the blue dot which starts behind the forest canton Poiana Bichii. Canyons, caves, pit caves, sinkholes, ridges, valleys, pasture and forests that stretch on Anina and Semenic Mountains form eight natural reservations brought together under the name of Semenic – Cheile Caraşului National Park. In this strictly protected area, any form of use or exploitation of natural resources, any form of usage of the land is forbidden. That is why, tourists can experience untouched wilderness in the caves Răsuflătoarei, Comarnic, Popovaţ and Exploratorii ’85 (Explorers ’85 in Romanain), Nera’s Springs (Izvoarele Nerei in Romanian), the gorges Cheile Caraşului and Cheile Gârliştei, Caraşului Springs (Izvoarele Caraşului in Romanian), Buhui, Turbării. From Bucharest, the Semenic – Cheile Caraşului National Park can be reached on road E70 (Bucharest – Craiova – Drobeta-Turnu Severin – Orşova – Topleţ) and national road DN6 – Mehadia. By car, access to the park is possible from any locality surrounding it: Reşita, Iabalcea, Carasova, Anina, Prigor, Crivaia or Gărâna (the last of them hosts of one of the most popular jazz festivals in Romania). Also known as the Sphinx in Topleț, this enigmatic megalith is still a reason for controversy among specialists. According to some, the 16 meters high and 8 meters wide rock resembling the head of a man was naturally formed in time, through wind and rain erosion. Others believe that its striking resemblance with an impressive, mysterious human profile is the result of an anthropomorphic representation. The rock is located on Cernei Valley in Caraș-Severin County, on road E70 Bucharest – Timisoara. It can be seen from distance, across the Cerna river, on the right side of the road to Timisoara, after Toplet, about 3 kilometers before reaching the train station at Băile Herculane.